Cheap Flights to Los Angeles, United States (USA). Return Flights. The largest city in California and the second-largest in the USA, Los Angeles offers everything from Hollywood glitz to world-class cuisine and outstanding natural beauty. Founded by Spanish colonists in the late 18th century, Los Angeles was the capital of California during its period of Mexican rule. Los Angeles sprawls across several counties, and many of its most famous tourist attractions are actually in other cities; for instance, Disneyland -- which welcomes over 15 million tourists each year -- is located in the neighbouring city of Anaheim, part of Orange County. LA's most famous museum is probably the J. Paul Getty Museum, perched on the slopes of the Santa Monica mountains with stunning views out over Los Angeles and the sea. Other must-visit cultural destinations include the Museum of Contemporary Art (MOCA). For those who prefer science to art, the bubbling depths of the La Brea tar pits hold the preserved bones of giant Ice Age animals, still being excavated today. 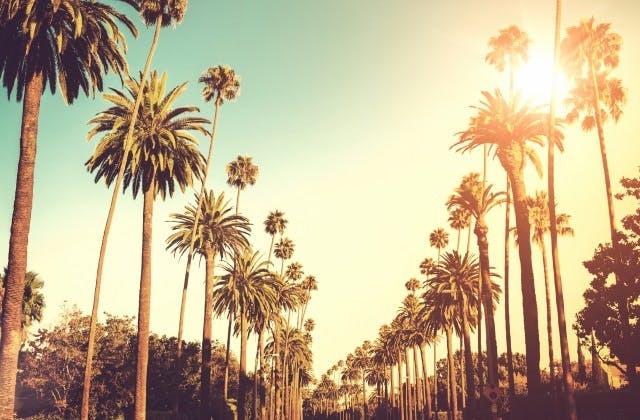 No visit to Los Angeles would be complete without some shopping, whether among the high-end boutiques of Larchmont Boulevard or Melrose Avenue or the art galleries of Main Street. The Downtown area is home to specialised districts focused on everything from flowers to toys to seafood. Visitors to LA can eat well without spending vast amounts, from the traditional American cuisine of Mel's Diner in Hollywood to the culture of gourmet food trucks that congregate in public spaces. The urban sprawl of Los Angeles can get a little monotonous, but there are a surprising number of patches of nature in the city; the former ostrich farm of Griffith Park in Los Feliz is one of North America's largest parks, containing theatres, zoos, a small railroad and a famous observatory. Nearby beach towns like Venice and Huntington Beach attract sunbathers, surfers and sightseers who want a break from the city. Los Angeles has a warm, Mediterranean climate; summers are hot but not scorching. The city isn't very walkable, so expect to drive wherever you go -- and allow extra time to account for heavy traffic at peak times. Los Angeles has the Coordinated Universal Time value of -28800. Los Angeles has the IATA code of LAX. The cheapest flight from Adelaide to Los Angeles is $895 on Delta.